Billy Sharp’s brilliant hat-trick against Wigan last weekend edged him closer to setting a new goalscoring record. Since the turn of the century the Blades skipper and scored a total of 214 league goals. Ricky Lambert is the only other English footballer to have scored more league goals since the year 2000. The former Southampton, Liverpool and England star – who retired from football last year – notched 219 league goals during an impressive career. This means Sharp needs just six more league goals to write his name into the history books and on current form few would bet against him achieving that fete soon. 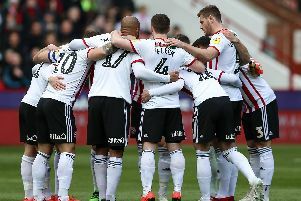 Earlier this season the 32-year-old Blades striker surpassed Wayne Rooney’s tally of 207 league goals in the 21st Century. The all-time record for English league goals belongs to Arthur rowley who scored 434 goals for West Bromich Albion, Fulham, Leicester City and Shrewsbury Town between 1946 and 1964. Two former Sheffield United players make the all-time Top 40 list – Harry Johnson (307 goals) and Keith Edwards (254 goals).